Pretty much already said a lot about this Feraligatr with the last review of the old one, but to summarize: it’s nice to see a major improvement to Feraligatr, though it’s unlikely to have a huge impact if the cards around it aren’t as powerful for whatever reason. He’s got potential, but he needs the right pool of cards to be effective. Arora Notealus: Love my gatr. Another runner up spot is Feraligatr (Dragon Majesty 24/70), which is a spiritual reprint of Neo Genesis due to having identical attacks and effects. I don’t have Ctrl-F in my iPhone that I use to type those reviews, but I can link you to the latest review, which happens to be one of their Throwback Thursdays. Considerably older reviews probably gets lost in the rubble, unless you are brave enough to scroll down all the way to the bottom. The gist of this card is to use the Downpour ability to discard as many Water Energies from your hand, so that you can amplify the damage output of Riptide. For the new Feraligatr, that means doing 10 damage for WW, plus 20 damage for each water energy in the discard pile, and then you put that many energies from the discard into your deck. This attack has the capability to OHKO anything in the game, and based on printed HP scores, you’ll need 12 water energies in the discard pile. Fortunately, there are ways to cycle through repeated use of Downpour and Riptide, but that means you must have those cards. There are two cards that I can think of regarding Standard. Ribombee (SM Burning Shadows 96/147) has an ability called Honey Gather which lets you search your deck for 2 Basic Energy cards and put them onto your hand, ready to be discarded by Downpour. Lady (SM Forbidden Light 109/131) is a Supporter that fetches 4 Basic Energy cards from your deck into your hand, ready to be discarded. With Lady and four Ribombee in play, you can actually fetch 12 water energies, exactly what you need to OHKO any Pokemon in the game, without the need of a Choice Band! Though if you do equip Choice Band, then you’ll need 11 Water energy in the discard pile based on printed HP scores, and the highest is 250. Factoring it’s water typing that can exploit weakness found on most Fire types and some Fighting types, and you’ll need just six water energies in the discard pile to OHKO anything weak to water. Like Charizard, Feraligatr should be the focus of it’s own deck. Unlike Charizard, a Feraligatr deck would probably have around 15 energies and between 15-20 Pokemon, not having much room for trainers after four copies of Lady in your deck. What do we get from this package deal? A functional but not quite competitive deck that can take wins against other decks that aren’t prepared for it, but not frequently enough that you consider adding cards to ruin the Downpour/Riptide strategy. For Expanded, you got Battle Compressor to help get water energies from your deck into your discard pile, but then you may have to deal with abilities going offline via Garbodor’s Garbotoxin ability, so Field Blower may be a necessity. Standard also has ability lock, but is targeted by Basic Pokémon by Alolan Muk’s (Sun & Moon 58/149) Power of Alchemy ability. Glaceon-GX’s Freezing Gaze shuts down Abilities from EX/GX Pokemon. So that means non-GX Stage 1/2 Pokemon are safe; Feraligatr and Ribombee won’t have to worry at all! I don’t consider Battle Compressor to be a gain since you got Ribombee and Lady to do the work for you, so it scores lower in Expanded. Dragon Majesty doesn’t host Prereleases, but even if it did, Feraligatr can’t do much here. Lack of draw in this set, and I don’t even count Blaine’s Last Stand as it is very unlikely that you can almost reduce your hand size down to this Supporter card and have Fire Pokemon in a 40-card Feraligatr deck. Conclusion: Feraligatr brings back an old trick that can still maintain traction based on the cards that I’ve mentioned in the review. Whereas you previously need Professor Oak and Bill to draw cards, now you can use Ribombee and Lady to fetch energies…without compromising your hand. The damage multiplier is just enough to barely achieve OHKOs, but part of me wishes that it did 30 more instead of 20 more to make the job easier for Feraligatr. What we still got is potential. I wish you all the best if you do consider using this Pokémon! Feraligatr (DRM 24), like Drampa yesterday, gets another version in the Dragon Majesty expansion set. We last saw Feraligatr in Shining Legends, and this DRM version also has an extremely impressive 160 HP and a potentially powerful feature attack in Riptide. Riptide does base damage of ten and then twenty additional damage for each Water energy card in your discard pile. 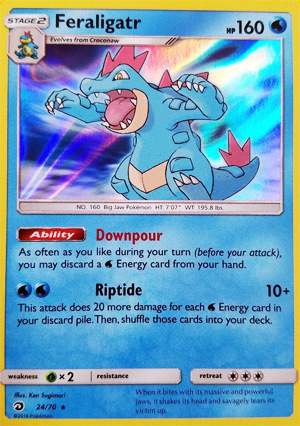 Furthermore, Feraligatr has an ability Downpour which allows you to discard as many Water energy from your hand as often as you want prior to attacking. The attack costs two Water energy… two Energy cards that you can’t discard, so forty less damage. All of the energy cards get recycled back into your deck. This is potentially devastating late game. If you have ten cards left in deck and recycle ten water energy back into that deck, you’re going to have a hard time getting Supporters or Items or other cards you might potentially need because all that energy will clog up your deck. We do have resources such as Ribombee (BUS) and Lady to get a lot of Water energy in your hand, but it’s just going to be difficult to execute this attack effectively on a consistent basis. If any of the above were different – if it only cost a single Water attachment (although that’s a lot to ask), if it didn’t recycle every Water card back into the deck, if it did thirty instead of twenty (meaning you don’t need to get so many Water energy cards into your hand) – Feraligatr would no doubt function as a more effective feature Pokemon. As it is right now, however, this Dragon Majesty Feraligatr just has too much working against it to win in a highly competitive meta. Maybe it could work as a one of in a deck, come in and put a big hit late in the game. Maybe it will facilitate the use of Aqua Patch, although now that Puzzles are gone and we’re limited to four Aqua Patches a game, that seems less impactful. And maybe I’m wrong here, I have not tested this card yet, but it just seems like it has too many constraints to really be a top tier archetype. Feraligatr is definitely a card to keep in mind, however, as this is one of those cards that could become significantly more competitive with the introduction of new cards in the future. And Feraligatr will be around for almost three years, so it will have plenty of time to benefit from future releases. Time to look at my number three pick for Dragon Majesty, Feraligatr (Dragon Majesty 24/70). If we’d started the countdown from a high enough number, Feraligatr would have been our 7th place pick with 13 voting points… only 10 of which came from me, while three came from one other reviewer. I would love to tell you that I’ve been tearing things up with Feraligatr on the PTCGO but once again I dropped the ball, so we’re operating purely on Theorymon. This Feraligatr is based on Feraligatr (Neo Genesis 5/111), which was the focus of what was widely considered to be the top deck of the original “Rocket-On” Modified Format, what we now think of as the 2001-2002 Standard Format. Can its descendent cut it? Feraligatr is a Stage 2, and that’s its main drawback. It isn’t all bad, though. For its Stage 1, you can use Croconaw (Shining Legends 19/73) has the Ability “Plunge”. Plunge can only be Activated once per turn, while Croconaw is on your Bench, and it allows you to move all Energy that was attached to the Active to Croconaw itself, then promote that Croconaw to your Active position. This opens up Acerola/Max Potion shenanigans, which helps Feraligatr if you time things right. Of course, you could just use Rare Candy instead, and I’m guessing a combination of the two is in order. Feraligatr is a [W] Type, not so great for hitting Weakness at the moment but Aqua Patch is amazing. All Totodile ever released EXCEPT for the Unlimited Format exclusive Totodile (EX – Dragon Frontiers 67/101) are also [W] Types, making Brooklet Hill will probably help with setup. In Expanded, you get even more goodies like Dive Ball and Splash Energy to help out Feraligatr… but you’re probably still wondering why you’d bother with a Stage 2. While its [G] Weakness, lack of Resistance, and Retreat Cost of [CCC] vary from poor to bad, Feraligatr has 160 HP. It also has the attack “Riptide”, which for just [WW] that does 10 damage plus 20 per [W] Energy in your discard pile… before shuffling all those [W] Energy cards back into your deck. Six [W] Energy in the discard pile and Feraligatr is swinging for 2HKO’s against just about everything. Eight [W] Energy and nearly all Basic Pokémon-GX plus nearly all non-Pokémon-GX are in OHKO range. If you can dump 12 [W] Energy into your discard pile, Riptide does 250 damage, enough to OHKO anything in the game… at least based on printed HP scores, before we worry about defensive buffs. Choice Band lets you hit the numbers for one or two less [W] Energy. Now, how do you get enough [W] Energy into your discard pile? A lot of it can come from the Ability, “Downpour”; Downpour lets you discard a [W] Energy from your hand whenever you want, as many times as you want, during your turn before you attack. This is more important than it sounds; while it means that a Lady is worth +80 damage, it means “Draw until you have…” effects should be much easier to use! At least if your deck runs a lot of [W] Energy and that should be a safe assumption for a Feraligatr deck. It also helps if you run a good amount of easy-to-burn Items, like Acro Bike. Cards like Lillie and Oranguru (Sun & Moon 113/149; SM – Balck Star Promos SM13) is are much nicer when you can increase their average yields. So, when I get off my duff and trade for what I need, I’m hoping for a deck where my Supporter for the turn, plus two to three Benched Oranguru make having 7 to 10 basic Water Energy cards in my discard pretty plausible. If I don’t mind giving up the edge created by not relying on Pokémon-GX, then Tapu Lele-GX and Zoroark-GX make sense. On paper, as I craft my Theorymon. One thing that might help it is that it fits into a particular niche. Are Pokémon-GX dominating? Feraligatr is a single Prize attacker that at least has a chance of swinging for a OHKO and should be scoring 2HKO’s reliably. Are single-Prize attackers and/or anti-Pokémon-GX tactics on top? Feraligatr is a single Prize attacker that should be somewhat reliably swinging for OHKO’s while being a little tricky to OHKO back. Feraligatr may also work in Expanded, where Battle Compressor and VS Seeker make things so much better not only for their usual reasons but because once you have all the Supporters you want in your discard pile, each Battle Compressor is +60 damage. Of course, it faces more counters and competition here. Feraligatr is in a set that didn’t have Pre-Releases, and where the booster packs are only available in things like gift sets, so I don’t know if you can even hold a sanctioned Limited Format event using it… but if you do, Feraligatr is great… as a finisher, because it will be hard to restock your discard pile. I suppose you could just try to play conservatively and build up more [W] Energy in hand so that after your first Riptide clears out your discard pile, you can then dump what you have in hand via Downpour.